Volunteers digging in. View more photos from this event on Flickr. 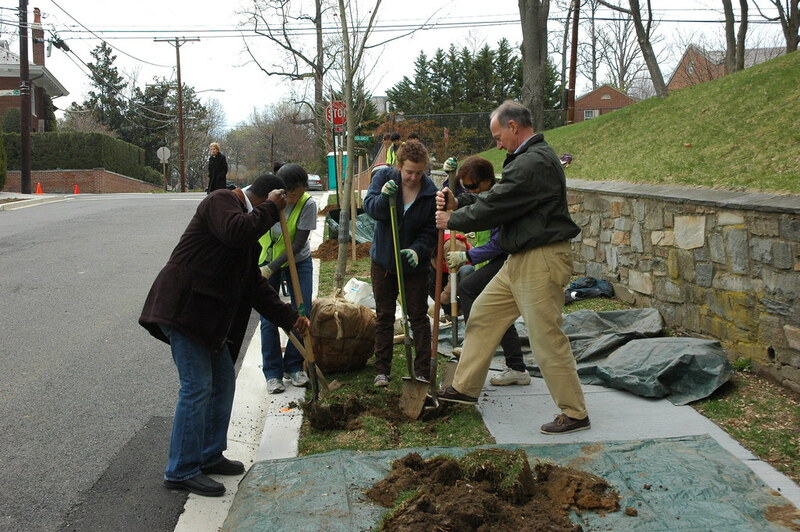 This weekend we planted trees at Woodland-Normanstone Terrace, our fourth Community Tree Planting in four consecutive seasons in the neighborhood. This was a notable planting as we planted the 100th tree in Woodland-Normanstone, with 28 trees planted in total. We had a turnout of 73 volunteers including 17 Citizen Foresters. Everyone joined together at the beginning before the safety demonstration, taking turns reading the poem "Trees" by Joyce Kilmer. The event concluded with champagne, beer, grilled sausages and tea sandwiches. Thanks for coming out to plant trees with us this weekend! We're glad we could play a role in planting one hundred trees in your neighborhood. You can view photos from this event in a photo set on Flickr. If you want to see all of the events from this season, browse the Spring 2011 collection or view the map of photos from recent plantings. There are plenty of opportunities this season to join us at planting events so take a look at our calendar and register to volunteer online.